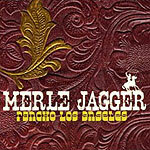 CD review: "Rancho Los Angeles"
This review first appeared in Turbula in August 2006. Imagine blues guitarist Ronnie Earle sitting in with legendary country picker Chet Atkins, with surf pioneers The Ventures backing them both, and you've pretty much got the vibe of Merle Jagger. It's instrumental country surf blues performed with enthusiasm and virtuosic excellence. Crisp arrangements, solid chops, and a driving beat give the L.A.-based trio a sound unlike anything else going today. The only band that ever even came close to this melding of various American styles into an all-instrumental stew was The Tailgators, a late '80s/early '90s vehicle for former LeRoi Brothers guitarist Don Leady. Here the star is guitarist Mark Christian. Not to downplay the absolutely firm foundation laid down by bassist Patrick Flores and drummer Brandon Goldstein, but Christian's near-bluegrass speed picking while organically working various pedals and effects boxes is what makes this CD such a unique listen. Having him turn in passages on banjo and mandolin, too, only adds to the whole experience.